Our Fabulous Fridays are absolutely fabulous; doncha think????? This friday, our challenge is called "Anything But" and our lovely guest designer, Wendy has posed this very fun challenge to you! Here is what she says, "Can you believe that Christmas is less than 2 months away??? (Uh...thanks for reminding me Wendy!) I have so much to do and so many cards to make!!! Since my challenge this month for the Fabulous Friday was to do something other than a layout - I thought we could get a jump start on making some Christmas cards. I know some of us made a few during the crop so let's keep the momentum going. 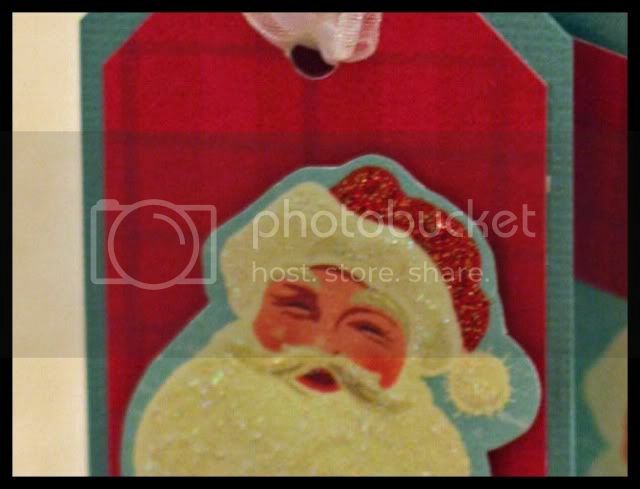 My challenge to you is to create a Christmas card with LAYERS and BLING!!" 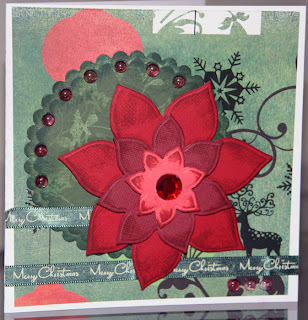 Wendy's card with the poinsettia and circle are by Spellbinders that she has inked with distress ink. The layers are created with 3D foam dots. Thanks for the challenge Wendy! Your card is gorgeous! So ladies...when you complete the challenge, link me up! I'll put an extra ballot in my box for this week's prize! It seems that I cannot get enough of Pink Paislee these days! Each of their collections has been fantastic. The colours, patterns and accessories are gorgeous and versatile. Here is the Amber Road collection. When I first purchased the papers and accessories, I thought for sure I would be scrapping autumn themed layouts and earthy cards but in the end, it was the perfect choice for my annual family photos. 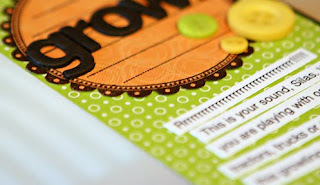 The layered scalloped edges were created with the Fiskars threading water border punch. Aren`t the die cuts super cute? versatile? The edges were inked with SEI Cocoa Ink Chalk - can't get enough of that colour! And...here is a picture of our giveaway this week! So don't forget to leave a comment to make sure your name is entered into the weekly drawing! Check back in a day or so for more opportunities to win! One of our newest Design Team members is Denise Schurman or more commonly known as Neisey. I recently had the opportunity to interview Denise so we could get to know her a little bit better. IRL I go by Denise, unless you happen to be a kindergartener and then you probably call me “Mrs. S.” On-line I am Neisey which is DH’s nickname for me. Another nickname (that I probably shouldn’t be sharing on the Internet) is “Jel” which is short for Jelly Belly, a term of endearment from my first pregnancy and has absolutely nothing to do with the current state of my abdominal region. My family currently lives in a small village in the Ottawa area. We love it for its great community feel but eventually want to move back to the Maritimes where both DH and I grew up. We are specifically interested in Fredericton, NB as it is not too close and not too far from his family in PEI and mine in NS. My entire family would be shocked if my scrap room was ever neat. I am beyond the point of creatively messy and well on my way to being either featured on the show “Hoarders” or being condemned. I have learned that if I do a little bit of housework everyday I won’t feel stressed when Dan invites someone over and remembers to tell me 2 minutes before their arrival time. I am drawn to brights for details (red, turquoise, pinks) but love to place everything on a neutral background (black, white, kraft) to make things pop. Lately I have been using my Silhouette digital craft cutter because it can cut any title or shape I want in any size I want. It is so easy to use and now I won’t have to spend so much on dies, punches, etc. Of course I will just siphon that money into other scrapbook supplies but there is no need to let DH know that. I am definitely a simple scrapper although from my enormous stash of stuff you would never guess that. I would also describe my work as linear and balanced. Think Cathy Z but unfortunately not nearly as good. I have a Pentax K10D DSLR and love it. I would consider myself a serious hobbyist and I’m always reading up on tips and techniques. Unfortunately I don’t have many willing models at my house. Definitely a night hawk but having kids has certainly put a damper on that. Could I pluralize food??? Scallops, Donairs, Chips, Guacamole, Pub-style fish and chips, McDonalds (I know, I know, but I love it!) Lone Star fahitas…excuse me while I clean the drool off my keyboard. Usually a 6. My 10 year old daughter is already wearing bigger shoes than I am. Besides the ubiquitous dust bunnies? We have a platform bed with 6 drawers but none of them hold my stuff. They are mostly jammed full of Dan’s military wool socks and his t-shirt collection dating back from Junior High. Thankfully, it is only 10am so I can’t answer that. However my MIL was here on the weekend visiting from PEI. They own a number of maritime based pizza franchises and she brought me all the fixings for donairs – refer to question above asking what food(s) I would like to eat every day – so I think I’ll treat myself to one for lunch today. It’s kind of hard to narrow it down. I’ve been scrapping for 11 years so I have lots of layouts that may not be artistically wonderful (Paperkins, anyone?) but bring back wonderful memories. Also, I tend to think that the project I’ve just completed is a fave too. That being said, I don’t scrap a lot about me so I’m going to be a little egocentric and choose this simple LO about my faves. Thanks so much for sharing yourself with me and your friends, Denise! I look forward to seeing more of your gorgeous work in the gallery! OK seriously... how can I be expected to pick one favorite when we've had the most fabulous crop weekend EVER!!! Must see TV easily translated into Must Crop! LOL There were so many challenges to choose from... the opportunities were endless! So as far as a favorite goes... it's an impossible task... but I will share one that really touched my heart... there is nothing like a new baby to make you go all mushy inside, and this layout by Kelly is perfect! Check out the gallery when you have a chance... it is BURSTING! Welcome to our Must See TV Online Crop! As is our tradition, we like to kick off our crops with an early "Scrap Shotz Gives Back!" Challenge! If you're new to our gives back challenges, every crop, we select a charity to donate to. All of members are encouraged to complete a card or layout based on this challenge and to upload it to the Gives Back thread by the end of the crop (only 1 layout or card per member, please!). For each layout or card, Scrap Shotz will donate $5 to this crop's charity, the Canadian Breast Cancer Foundation! As most of you know, October is Breast Cancer Awareness Month, and their signature colour is. . . . PINK! This time our challenge is simple! 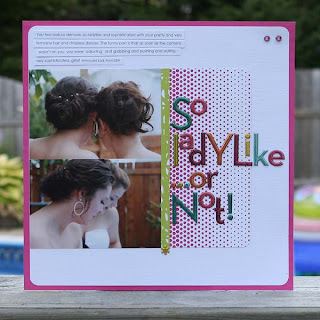 We challenge you to complete a layout or card that has pink on it - any shade, anywhere! A lot or a little. Light or dark, it's up to you! When you've completed your layout, please post it here and don't forget to grab your gives back blinkie designed by the lovely and oh so talented Jess from the Scrap Shotz gallery. Here is the uber talented Kathy's layout to kick things off! A Couple More Sneaks For You!!! Just one more sleep and it will be time to have some scrappin' fun! Here are a couple of sneak peeks from Heather - can you guess what the sneaks are for??? Check back tomorrow to receive up to the minute information on our Early Bird Challenge! I am so excited about this weekend's crop that I am bursting at the seams! While I can't divulge all the secret planning details, I can give you today's sneak peeks at the Design Team's challenges, inspiration and projects. Do I have your interest piqued??? Not sure if you have heard but....there is an absolutely fantastic "Must See TV" Scrap Shotz online crop this weekend...yes, October 23 to 25! I hope to see you here because there are some inspiring and gorgeous challenges, make n takes and games...and did I mention prizes??? Because there are prizes to be had!!!! Today is the first day of sneak peeks for you...can you guess? So will I see you this weekend? Wow the gallery has really been an exciting place to be this week! With so many fabulous challenges at our fingertips, the only hard decision is which to do first! Tanya created a layout of her girls based on Amber's Fab Friday challenge... I love the photo and it's set perfectly in some warm country paper and embellies! Great work Tanya! Tanya also has a chance to WIN with this layout! Be sure to comment on the blog and link to your Fab Friday creation in the gallery and this month's winner could be you! I *think* there may be something else up for grabs this week... stay tuned! We can find inspiration for our cards and scrapbook pages just about everywhere if we train our eyes to see it! One of my favourite places to look is in clothing. With so many colours, designs, patterns and textures, inspiration is abundant! When I saw this gorgeous little dress by April Cornell, I knew the colours and rich patterns would make a beautiful backdrop to a card or layout so I went to work finding similar patterned in my papers. Photo credits to April Cornell (aprilcornell.com). After pulling a few scraps out, I pieced together my background with similar proportions to the dress. Then I added in the sentiment and icon with a crisp, clean white, mimicking the bright petticoat under the dress! So as you can see, we can find beautiful inspiration in even our fashion trends. 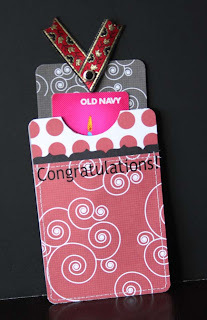 My challenge to you is to create a layout or card inspired by the dress pictured above. I can't wait to see what you come up with! I am sitting here with a wee frown on my face, staring in disbelief at the snow falling. What happened to fall?? Just to capture a few more moments of summer, at least until the chinook in Alberta hits, is a layout using the yummy My Mind's Eye, Bloom and Grow Collection Pack. The fancy edge was created using the Fiskars Apron Lace Border Punch. The journaling is a Jenni Bowlin journal spot from a previous Scrap Shotz kit and the brads are from an older Basic Grey brad pack. Of course, I used thickers for the title! Lastly, I used a Copics Multiliner Black Pen 0.5 to create the stitching around the circles and die cut flowers. I hope this layout makes you feel a bit warmer! Hello everyone! Well the gallery was hopping this week for sure! 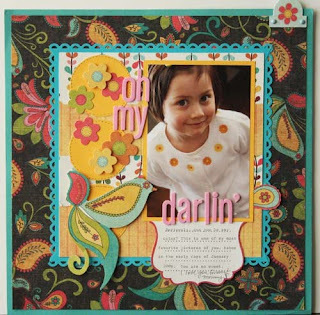 I wanted to share with you a layout by one of our newest members Ruby (inspired scrapper)... I just love all the details in this one! Gorgeous work Ruby! 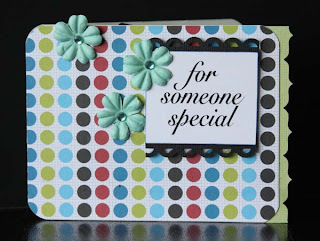 Join Scrap Shotz as we launch a new feature on our blog for inspiration and challenge - it's called Fabulous Fridays! For this week only, we will be showcasing two challenges by Denise and Heather. Heather is challenging you to a Blueprint Challenge. Her sketch is below. And this is her layout. How darling is this layout??? I love it! Denise's challenge is a Chromotherapy Challenge. Here are the details from Denise herself! Chromo comes from the Greek word “khr ma” meaning colour. Chromotherapy (AKA colour therapy) is based on the theory that colour and light can balance energy where ever a person’s energy may be lacking - physical, emotional, spiritual, or mental – and believe me, somedays I think I’m running in the negative on all 4! Different colors bring about varying emotional reactions in individuals. We often associate particular colours with particular emotions, for example, we often think of heat and anger as being represented by the colour red. As scrapbookers we also use colour to help bring about emotional reactions and connections to our scrapping projects. Baby pink for little girls, bright shades for parties and celebrations…I’m sure you’ve done it without even thinking because some of these colour/emotion match-ups have become so ingrained in us through various forms of media and advertising – flip through the Wish Book (hey, I know it is only early October, but we’ve had ours for months!) and when you hit the overwhelmingly pink pages you’ll know you are in the girls’ section. When I think of chrome meaning colour I instantly think of Paul Simon’s 1973 classic, Kodachrome. Although Kodachrome, the film, met its demise in 2009, Simon has marked the colour film’s musical place in history. 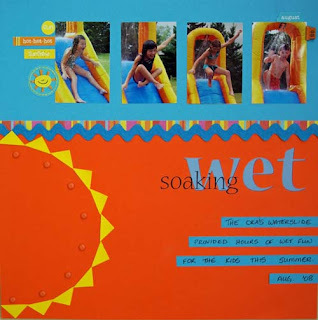 So, all ramblings aside, I challenge you to gather inspiration from the lyrics above to create a bright, sunny, summery LO. Thank you Denise and Heather for the inspiration and challenge! Please link me to your project in the comment section. At the end of the month, I will draw from all the comments and completed challenges for a RAK. Please let me know if you have any questions. Thanksgiving is this weekend – and is a time of giving thanks. 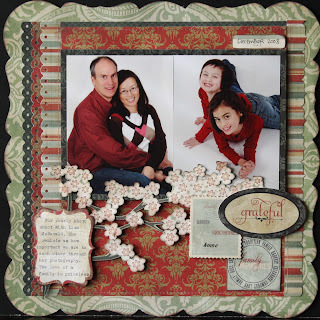 As scrapbookers we celebrate all of our blessings in our layouts. Here is a layout of what I am most thankful for…my family! These two munchkins mean the world my husband and I. Supplies: Prima (mulberry paper, flowers, pearls, gems); Heidi Swapp (alphas); Copic marker (dates); Tattered Angels Glimmer Mist (Cherry Blossom, Pink Bubblegum, Pearl). 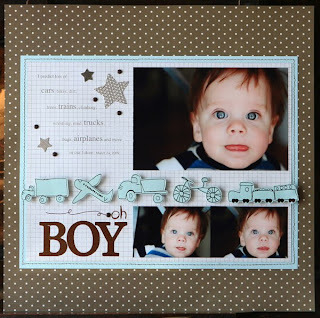 This layout was created using the uber awesome Prima stitched mulberry paper. To be perfectly honest, I am not a fan of mulberry paper because I find it difficult to work with and it so “stringy” but…never say never… I have always wanted to make one of those awesome canvases and this quite frankly is the next best thing. The Prima mulberry paper is as close to the canvas as I probably will get…plus, this is much much MUCH faster! The paper is gorgeous – the picture does not do it justice. There is stitching with shimmery thread and a beautiful coloured image to complement your photos and journaling. All you really need to do is add a photo and a few embellishments and you can call it done! This layout was so quick and easy that I will probably make a few to give as Christmas gifts this holiday season. After completing the layout, I’ll just pop it into a frame and fill in the gift card! So what are you thankful for? Leave me a comment and tell me what you are thankful for! Well how can I choose just ONE card from the gallery this week! 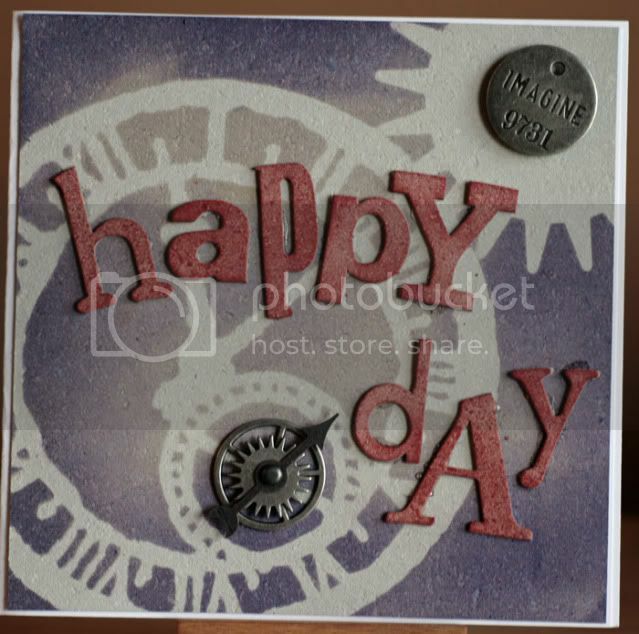 There were so many fantastic uploads on World Cardmaking Day! Here are a few for your viewing enjoyment! And I love this photo card done by kaluhakyla! Thanks for stopping by! 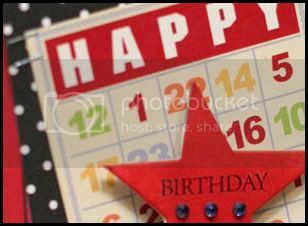 Make sure you check out the jam packed gallery from all the World Cardmaking Day festivities! 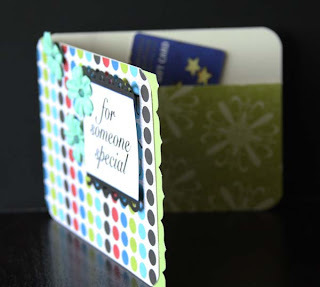 My challenge for you is simple - make a gift card holder. For Christmas gifts and hostess gifts, I love to give gift cards but they don't always look attractive from the store. 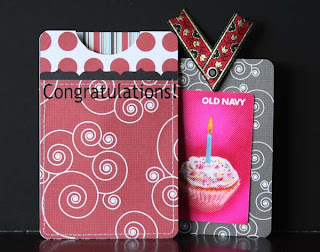 So here are two simple gift card holders to use as inspiration. Here is the front. 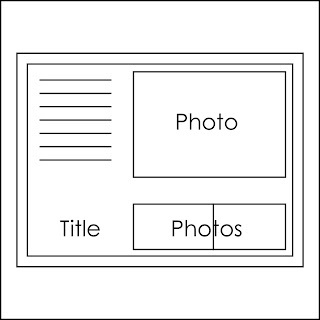 It is a regular card at 4.25"x5.5" with a landscape orientation. Papers and rubs are by Black River Designs. Flowers are Prima. And those awesome punches are Fiskars. The inside is a 3"x11" piece of pattern paper scored at 5.5" to create a pocket for the gift card. This literally took minutes to make! I know I will making several of these cards this holiday season! Another gift card holder is what I term a tag pocket. The tag holds the gift card and the pocket is made with pattern papers scraps. Again, the papers and rubs are by Black River Designs. The ribbon source is unknown and the fancy edge border is created by Fiskars. Here is another view of the tag-gift card combo in the pocket. Thanks for joining me! Don't forget to link me up to your project! 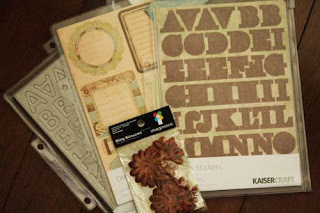 October 3rd is World Cardmaking Day! 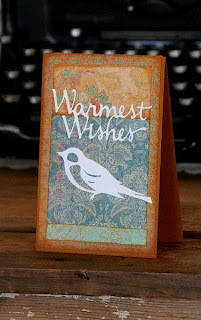 Did you know World Cardmaking Day marks the start of creating Christmas cards? Last year, I managed to make...ummm...zero cards and this year I am determined to make more! LOL To get into the cardmaking mood, I am going to join Scrap Shotz at their World Cardmaking Day Mini Crop this weekend. So what are you going to do this weekend??? I sure hope you join me! 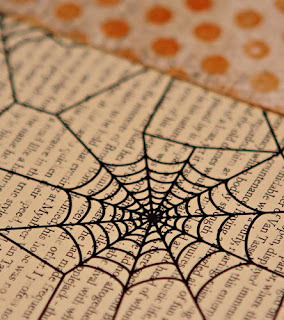 To get you started, here is a little sneakie peak from Wendy, our Guest Designer. Join me later tonight, well, 8 pm EST to be exact for an early bird challenge!